No one will ever accuse Amazon.com chief Jeff Bezos of stinting on investment. In five years through 2014, the company’s cumulative investment in property, plant and equipment has increased more than seven-fold, to nearly $23 billion (chart). When the books are closed on 2015, the total likely will be close to $28 billion. It costs a lot of money for the “everything” store to deliver just about anything you might want overnight, or, at most, in two or three days, plus movies, music, TV shows and the like. Delighting customers with low prices and fast service is what Amazon.com is all about. Margins and profits clearly are secondary. So no one should be surprised at the Seattle Times report that Amazon.com is negotiating to lease a bunch of used 767s to augment the delivery capacity it buys from United Parcel Service and Federal Express, and perhaps even to go in to competition with them. Proactively delighting customers earns trust, which earns more business from those customers, even in new business arenas. Take a long-term view, and the interests of customers and shareholders align. Amazon’s stock pays no dividend. 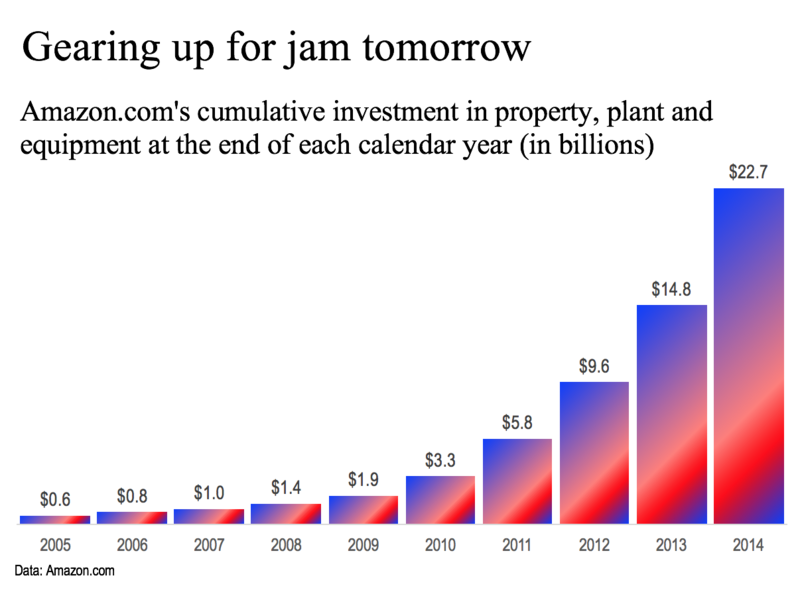 But “jam tomorrow” (investment) over “jam today” (immediate profits) has worked out pretty well for investors. According to Morningstar, $10,000 invested in Amazon.com stock a decade ago today would be worth about $150,000.